The Reality of Light in Roman Caravaggesque Still Life Painting. Michelangelo Cerquozzi was closely associated with Pietro Paolo Bonzi (Cortona 1576 - Roma 1636) and Agostino Verrocchio (Roma 1586 - 1659). 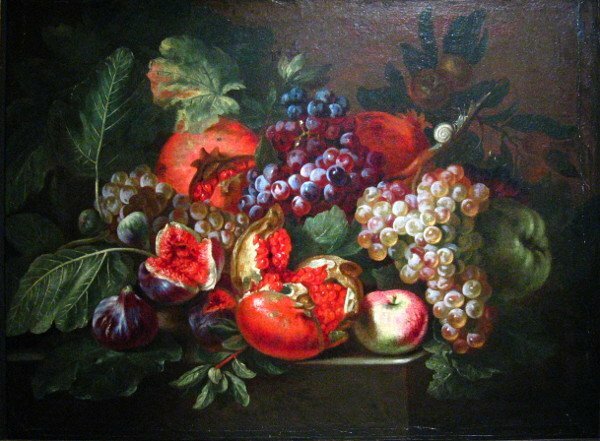 Known as a painter of battles and bambocciate, he was an important still life painter. Following Bonzi and Verrocchio, he moved away from the Caravaggesque style towards the lush and exuberant Baroque period of M. Campidoglio and A. Brueghel. The paintings of this Roman artist were much prized in the early 17th Century and cost three to four hundred scudi, whereas paintings by other painters, such as Stanchi, were valued at only forty scudi. His works were much in demand, both in Rome and the nearby states with major collectors such as the Barberini, the Colonna, the Chigi and the Salviati, who possessed numerous paintings by him.